Our Window feeder, hand made from reclaimed slate in our Riverside studio in Northumberland is still our most popular product. There are now 5000 places (in the UK and beyond) where birds and our customers can enjoy the window feeder. If you would like to order a Window feeder, please send me an e-mail (info@slateandnature.com) and we will arrange delivery. 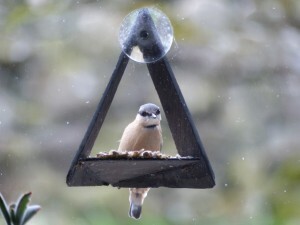 The Window feeder costs £ 19.50 and postage (by RM 2nd class) is £ 3.-.